You know those White Spot commercials? C'mon, the ones with some well-known local chefs such as Rob Feenie, Umberto Menghi, Melissa Craig and John Bishop. Yup, they're corny. But it does certainly get our attention. For those who are unfamiliar with John Bishop, he's been around for quite awhile. In fact, he once worked for Umberto before opening his own restaurant in 1985. 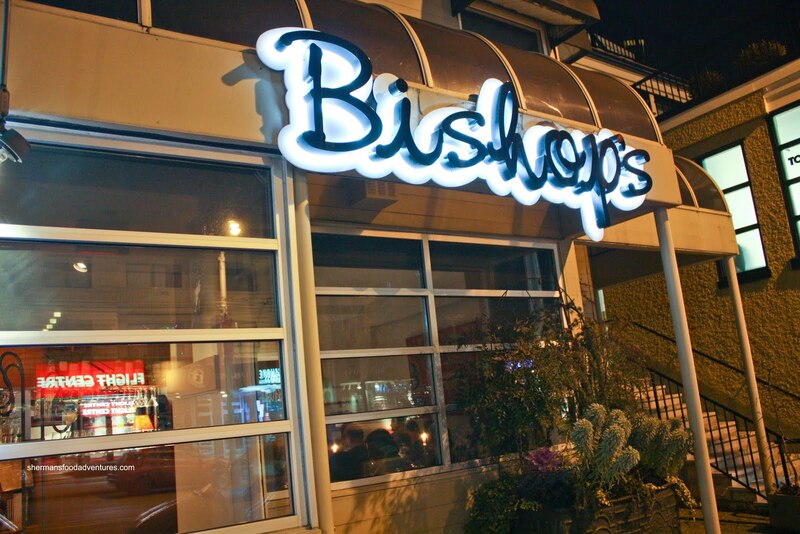 Located in Kitsilano, Bishop's has been one of the top restaurants in Vancouver ever since. 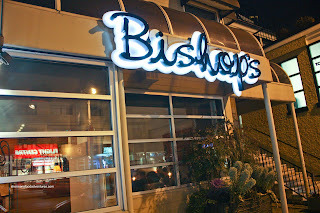 Uniquely Westcoast with influences from around the world, Bishop's is fine dining without the pretension. The last time we visited Bishop's, we wer e impressed with his sincerity and warm hospitality. Naturally, as much as it is wonderful and all, it does come at a price. $100.00 per person is what you would be looking at for a complete meal. The menu is simple; yet focused. The result? More attention is paid to the limited amount of dishes available. Furthermore, this usually lends itself to fresher ingredients. Tonight, Costanza and Elaine were treating since we paid for our last meal together at Cioppino's. Once we were seated, John Bishop greeted us as he usual ly does with his guests. This may seem like a small gesture; but it is nice when you see the proprietor care about his business and patrons. 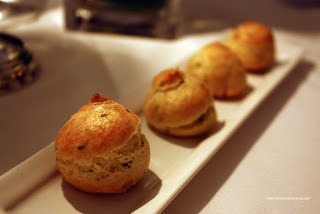 We started off with an amuse bouche in the form of Gougeres filled with Gruyere and Sunchoke Puree. 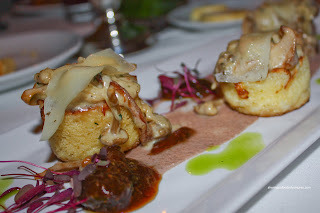 Served warm, these little morsels were bit earthy and completely delicious. For my appy, I went for the Pici Pasta with prosciutto Bianco, anchovy & radicchio, Meyer lemon and garlic. The pasta was al dente and held up well to the rest of the ingredients. There was a nice balance of flavours at work here including the bitterness of the radicchio, the understated saltiness of the prosciutto and anchovy. The lemon provided an ever-so-subtle tang to even out the flavours. I thought the sauce was luxurious and earthy. The crisp broccoli provided a nice textural contrast. Predictably, Viv had the Albacore Tuna Carpaccio. I think she likes raw fish... Anyways, it was beautifully presented with thin slices topped cured wild plum gelee, pickled shiitake and preserved burdock root. 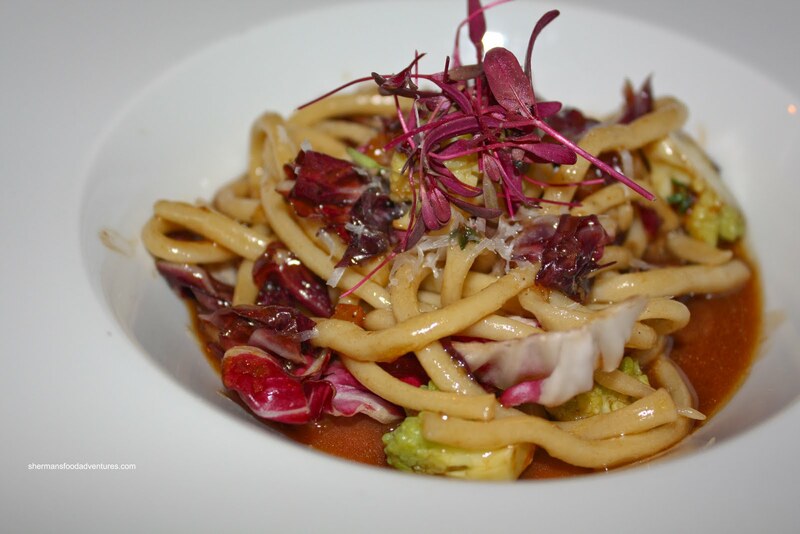 The combination of ingredients provided a subtle flavour which did not overwhelm the delicate tuna. The burdock root did provide some interesting texture to an otherwise "s oft" dish. Elaine picked the dish I was originally intending on ordering (Dungeness Crab Fritters); but due to variety for blogging purposes, I went for the Pici Pasta. When it originally arrived, it came all by it's lonesome without the other 3 appies. We were a bit confused since that is not the normal service protocol. Just as I snapped a photo of it, the same server who placed it on the table, took it back in a haste without warning and explanation. We figured that he brought it to the wrong table. Interesting service technique. It didn't really bother us per se, we did have a good chuckle; but for patrons expecting flawless service, this would be a no-no. When Elaine got her actual order of fritters, they sure looked appetizing. 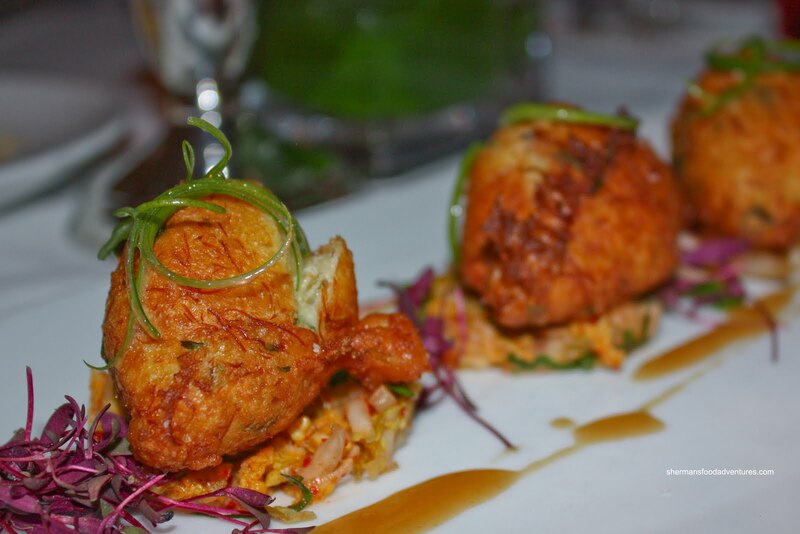 Resting on a bed of kimchi and a splash of miso reduction of the plate, these fried morsels were fluffy, naturally sweet and full of crab flavour. We're not sure if this was the intention; but the house-made kimchi was a bit bland. If it were just kimchi, it would be a fail; yet if it was prepared to not upstage the delicate crab, then it was a success. Costanza had dessert (or breakfast) for his appy in the form of the Brioche French Toast. It was a bit amusing that we all predicted he'd order this. You see, he likes to be a bit daring and different. This was the most unique appetizer on the menu and low and behold, he selected it. If you look at the picture, the plate has a lot going on. Resting on hazelnut paste and caramelized fig compote, the soft French toast was topped with forest mushrooms and Montana cheese. The toast itself was quite "eggy" and soft. Any crispiness would've been canceled out by the various sauces on the plate. Despite the sweet properties of this dish, it was able to be a bit savoury and earthy due to the mushrooms and cheese, giving it a certain umami-ness. 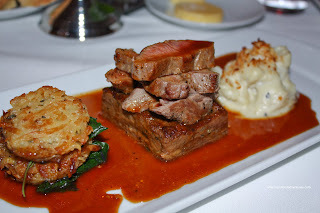 Just like at the Raincity Grill, I had lamb again. This time, in the form of Seared Lamb Loin and Braised Shoulder resting on a black elderberry jus. Parsnip potato cake with Swiss chard and cauliflower and blue cheese gratin completed the rest of the dish. The lion was quite tender and flavourful (Viv calls it gamy...); however, I personally would've liked it to be a bit more rare. The braised shoulder meat underneath was super soft with good hits of onion. Viv thought this was even more gamy. Pffft... Lamb is great, s he doesn't know what she's missing! I really enjoyed the cauliflower, it was cooked while still being crunchy. There was no shortage of flavour from the blue cheese (which I also love, Viv thinks it's smelly...). The elderberry jus was fantastic. Rich; yet light with subtle tartness at the same time (don't ask me how). Viv and Costanza both had the Thiessan Farms Squab to my dismay. No, I don't hate squab. It's the fact that I had less to blog about! Yes, I should let it go. I'm glad they put up with me in general! Rounding out the dish was a chanterelle mushroom puree, rosemary roasted baby beets, leeks and pomme anna. 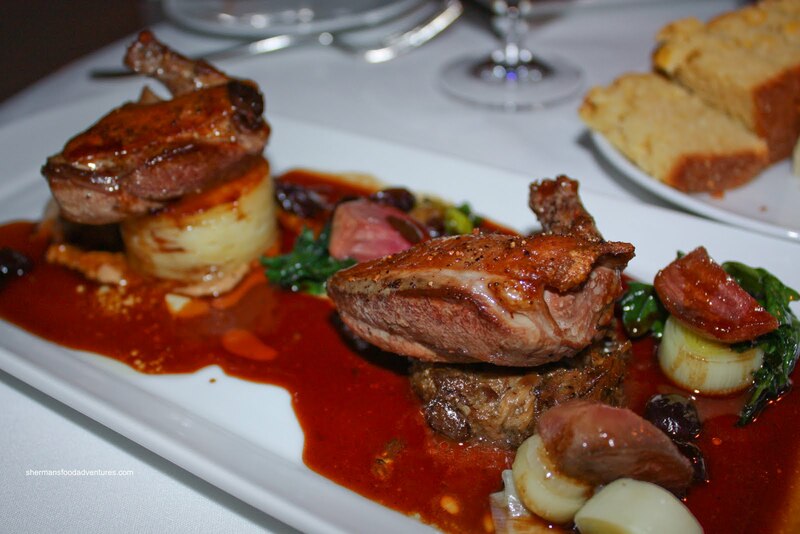 The beautifully (just barely) cooked squab was serenaded by a delicious coronation grape jus. The slightly sweet sauce was a great compliment to the robust squab. This was probably the best dish of the meal. That is a great segue to the consensus most disappointing dish of the night. 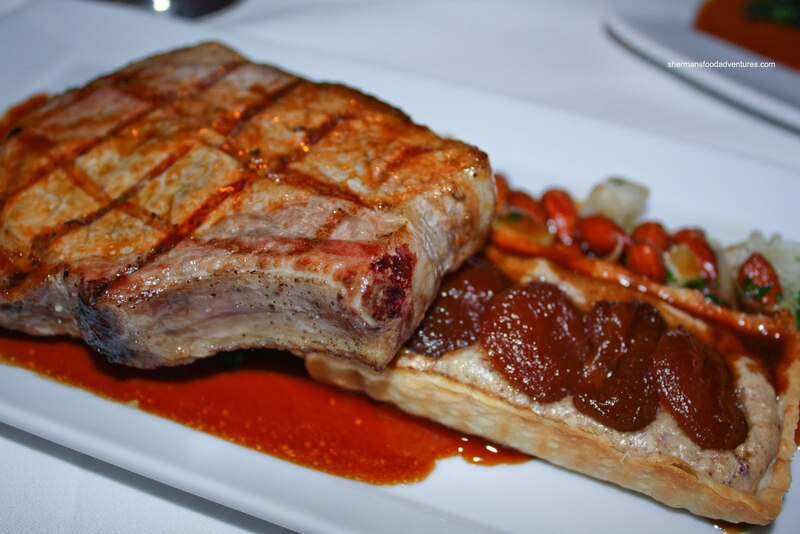 Elaine opted for the Grilled Sloping Hill Pork Chop with apricot jus. This was accompanied by a dried apricot and almond tart, turnips and baby kale. The flavour profile of this dish was predominantly and predictably sweet. Yet, that wasn't really necessary a bad thing since sweet goes well with pork. The problem was that the pork chop itself was quite bland and a tad tough. We realize that pork should be cooked through for safety reasons; but it was a bit too cooked. Not a terrible dish; yet it didn't hold up to the others. 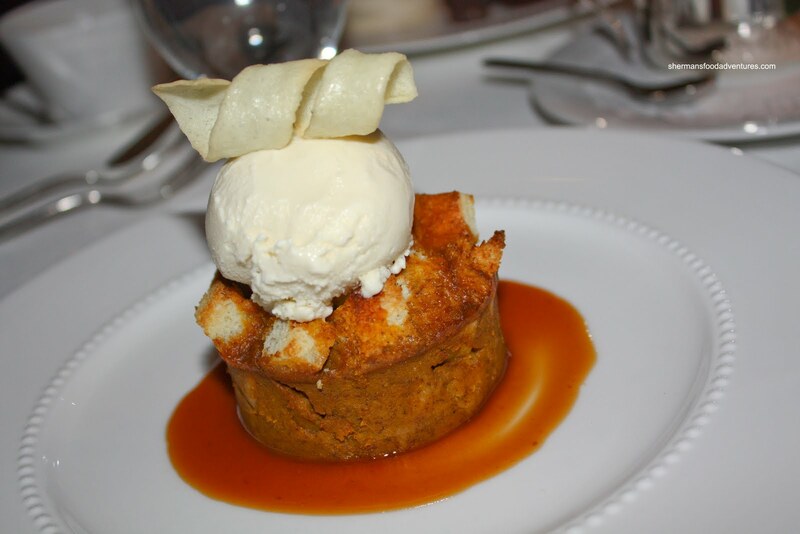 For dessert, Costanza went for the most "intriguing" selection in the form of Pumpkin Bread Pudding with ginger maple ice cream and caramel sauce. The crispy exterior gave way to a soft, fluffy interior. The bread pudding wasn't sweet itself, but the ice cream and caramel more than made up for it. The pumpkin and light ginger notes were not apparent at first; but were evident at the end. 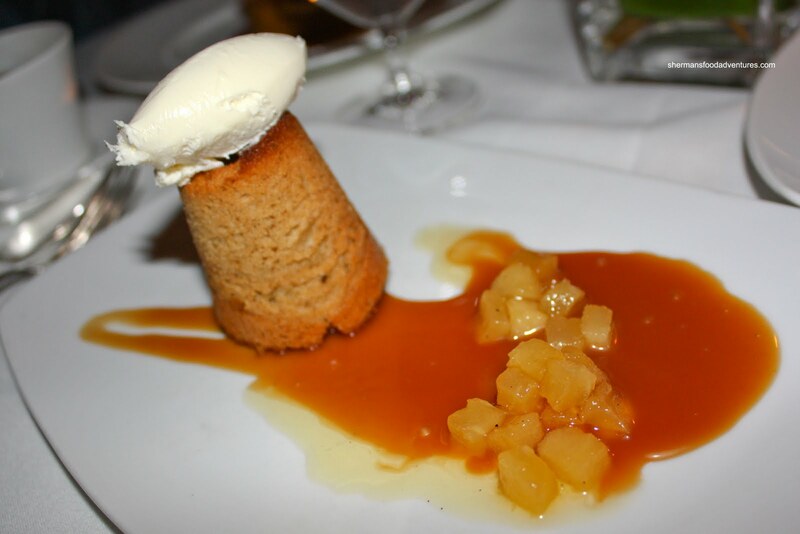 My choice was the Brown Butter Almond Cake with candied pear, rosemary caramel and marscapone. The cake was pleasant; but nothing really special. I did like the candied pear with the caramel sauce. It provided all the flavour needed for the dessert. Wasn't sure of the marscapone, it didn't add anything, I would've preferred some ice cream. 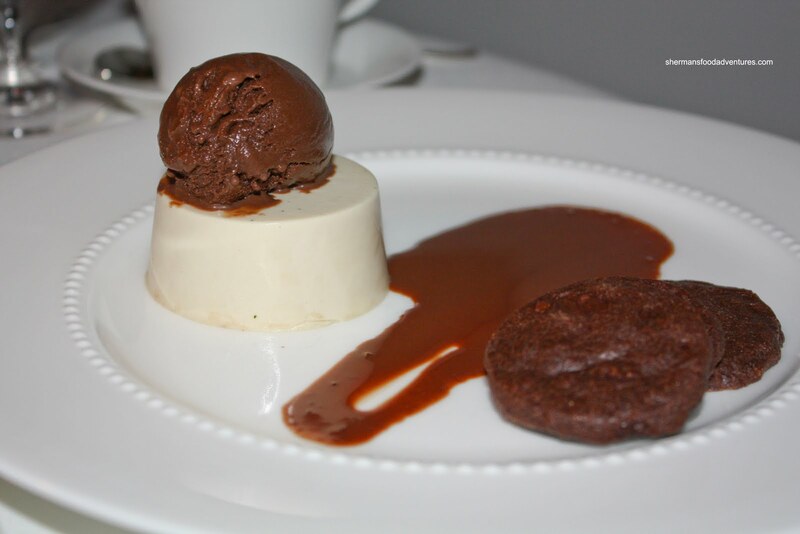 Viv and Elaine both had the Espresso Panna Cotta with chocolate sorbet and chocolate sables. Not exactly visually appealing (some red in the form of strawberries or raspberries would've helped), it did tast good. There was a predominant dark chocolate flavour while the espresso took a back seat. The panna cotta itself was a perfect consistency. Prior to our desserts arriving, our server presented me with a pear personally carved by John Bishop himself. Not sure why I deserved that, maybe the DSLR? Whatever the case, John Bishop is a sincere and gracious host. The food is solid and the service (other than that one incident) is excellent. 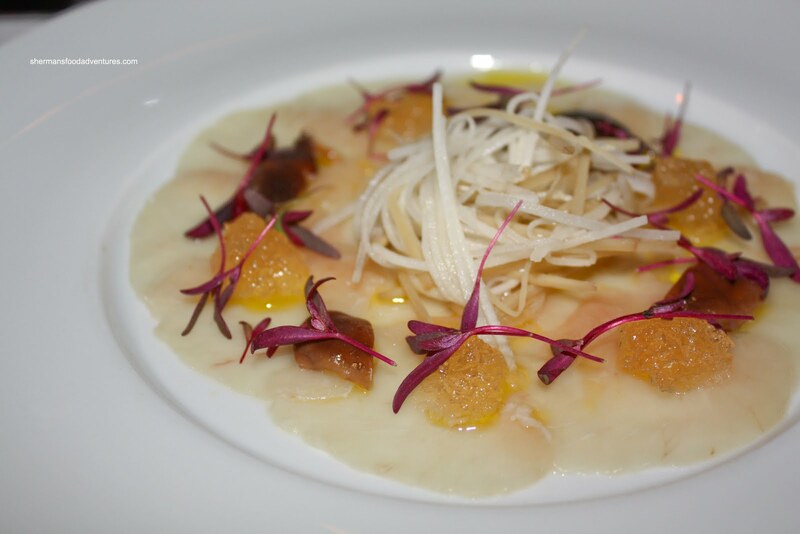 Combine that with a cozy room that doesn't exude pretentiousness, you have one of Vancouver's best restaurants. so the server just picked up the dish and took it? without saying a single word? WEIRD! 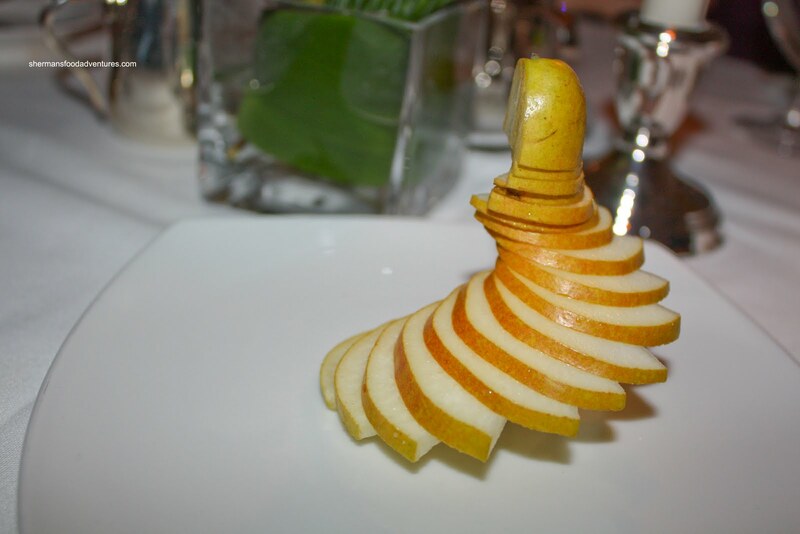 that pear looks incredible, how the heck did he do that? Yah, we were wondering why we got one out of 4 appies and then he comes back, swoops in and grabs it. We sat there a bit stunned. I'm not sure how he did that. My friend used to work there, I'll ask her! That looks like quite a treat, Sherman :) Glad to eat vicarious through you. Keep up the wicked work! Wow, could this be the longest entry for 2010? Thanks again for another great review Sherman. Quick question: Was that pear held together by anything? Thanks Anson! The pear wasn't held together by anything. I'm not sure how he did that really. It was a really yummy pear though!